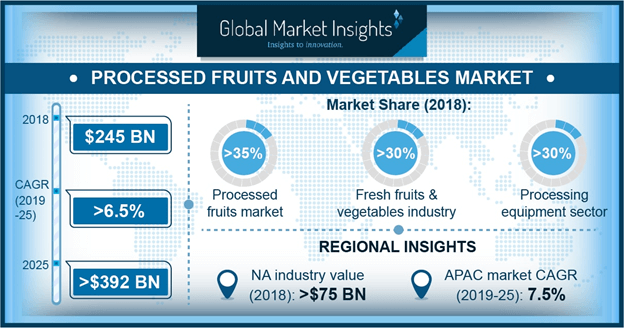 Processed Vegetables and Fruits Market size is estimated to surpass USD 392 billion by 2025; according to a new research report by Global Market Insights, Inc.
Strong outlook along with versatile applications across beverages, jams, dairy & ice cream, bakery, snacks, and confectionery industry are among key factors driving the processed vegetables and fruits market. Shifting consumer preference towards RTE food, and canned products will supplement market expansion. Additionally, technological innovation in dispensation techniques has enabled the manufactures to launch new products with a higher amount of nutritional content. Processed fruits is expected to hold over 35% of the overall market in 2018. Growing awareness among the consumers regarding intake of fruits daily owing to its nutrient-rich profile and high fiber content will propel the demand for the product. Increasing consumption of jellies, jams, confectionery, and marmalades, etc. by the young generation and will further support industry expansion for processed fruits over the forecast timeframe. Fresh fruits & vegetables accounted for more than 30% revenue share in 2018. Consumers inclination towards consumption of fresh fruits and vegetables owing to its nutrient locked feature is expected to boost the segment growth. Key factors including the absence of harmful contaminants, use of environmentally friendly preservation methods and freshness of the products will further increase the industry share. Processing equipment dominated the overall market accounting for over 30% of the industry share in 2018. Increasing consumption of convenience and RTE food owing to busy lifestyles and their ready availability will support the demand for this equipment in the forthcoming years. Also, incorporation of advanced technologies for processing fruits and vegetables has enhanced the accuracy, time required, and output, which will stimulate business growth. North America dominated the overall market in 2018 owing to high consumer spending on convenience foods coupled with growing awareness regarding the benefits of consuming fruits and vegetables. Additionally, increasing adoption of vegan & flexitarian diets owing to the increasing health issues along with demand for organic fruits & vegetables will provide strong growth prospects for the future. Extensive investments in automation technologies along with the presence of organized retail and e-commerce distribution channels will supplement the growth of processed vegetables and fruits market share. Asia Pacific is expected to witness the highest growth over the forecast period owing to rapid urbanization, penetration of organized retail, and foodservice industry across the region. Additionally, factors such as favorable industrialization policy, emphasis on novel technologies, and increasing cultivation of fruits and vegetables in countries such as India, China, and Indonesia will boost the product demand. The processed vegetables and fruits market share is highly fragmented with the presence of many regional players and multinational corporations. The key manufacturers include Dole Food Company, SVZ, Archer Daniels Midland Company, Sysco Corporation, Conagra Foods, and Nestle. The industry participants are involved in product innovation, collaborations, M&A, and capacity expansions to gain competitive advantage. For instance, in October 2018, Dole Food Company announced a new partnership with Safeway Fresh Foods to expand its product portfolio.